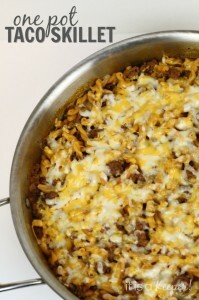 Add the ground beef, onion and taco seasoning to a large skillet. Brown beef over medium high heat. Drain excess great from beef. Add Campbell's Soups for Easy Cooking, chicken stock, pasta, salt and pepper. Put lid on skilled and bring to a boil. Reduce heat to medium and simmer for 12 minutes or until pasta is cooked through. Remove from heat, place shredded cheese on top and place under the broiler until the cheese melts (about 2 minutes). Copyright 2019 It Is a Keeper (www.itisakeeper.com). All rights reserved. When a recipe call for House Seasoning Blend, you can find the recipe on www.itisakeeper.com. Simply search for "House Seasoning Blend" or you can substitute salt and pepper to taste. I always use a meat thermometor to test for doneness when cooking meat.